I have sensed the innate magick the universe has to offer since I was a child. The canopied ravines behind my grandparents’ home offered grand exploration + investigation of the natural world which I was so fond of, priming my love and reverence of mother nature today. I could feel nature’s fury in her raging, electrifying storms which rattled inside my bones; and her gentleness in the drink of dew droplets found on every blade of grass on tranquil spring mornings. Animal encounters filled me with such joy; whether digging up earthworms to find the largest or cawing to the crows high in the treetops (and awaiting response!). Their instinctual intelligence, purity + innocence was like nothing else on the planet. I felt a deep kinship with them. So stumbling upon animal aid commercials was the worst – I’d bawl my eyes out feeling their suffering and sadness, unable to comprehend how anyone of them could ever be mistreated or undervalued. They have feelings and purpose, too, they have a soul – why could humans not grasp their worthiness? Why were animals and the environment not treasured? It was infuriating and painful to me. This heightened sense of perception attuned me closely to not only natural surroundings and animals, but people, as well. I could sense the energy of a room; read between the lines and pick up on things left unsaid. I just knew how people felt in certain situations. With a high level of emotional intelligence as a child, I understood when it was appropriate or not to ask my parents to visit the park or what have you – definitely not after a long hard work day! I realized later on in life that I was an empath or highly sensitive person, but in childhood, it was my inherent intuition, imagination, creativity + compassion that played a major part in my unfolding life experience. With an inclination to see/feel beyond basic reality, or what was said to be “so” by parents, teachers or peers, naturally, my curious mind questioned many things. I instinctively knew the world could offer much more than what was available at surface level, or what was taught in school and craved deeper experiences. I wanted mysteries explained; I desired to explore ancient Egyptian pyramids, seek out mummies and understand hieroglyphs; to plunge into the depths of the ocean and discover unnamed sea monsters; to hear stories from alien abductees or about advancements in extraterrestrial communication. This moment was truly special – but I craved to know what drove the magic of the Autumn breeze that seemed to gracefully encircle me with fallen leaves amidst the beaming golden light of late afternoon. It was a magickal, slow-motion type of moment. How? Why me – could others perceive this wonderment, too? Naturally, I was curiously drawn to seek enchantment beyond the mundane world, especially occult or “hidden” information not readily available to the masses, let alone children. Witchcraft, spellwork, psychic phenomena, paranormal activity, astrology, superstition, lore + legends of vampires, monsters, magicians fascinated and would beg my parents to watch horror films or stay up late to catch a young adult vampire show which aired way past my bedtime. I recognized a certain type of intrinsic personal power and greater natural force lay along the outskirts of this dimension available to anyone with an open mind + enough intrigue to peer beyond the illusion of everyday banality. Although I didn’t have the language, I understood this place. Growing up reading my aunt’s collection of astrology and Feng Shui books was greatly inspiring and encouraged my curiosity of unordinary fringe interests. I don’t recall sharing my learnings with elementary school friends though, because part of me knew they’d have no idea what I was talking about, but do remember the importance of placing a blanket over my bedroom dresser mirror (which directly faced my bed) in an attempt to rectify the inauspicious furniture placement by blocking the energy line. In Feng Shui, it is thought that mirrors are powerful tools which should be used very carefully. As they can reflect your own thoughts/anxieties, mirrors should not be placed in the bedroom or aimed directly at you, especially when sleeping, as it may interrupt the positive flow of energy. Tell that to a kid in 4th grade! Amusingly though, in retrospect, I feel this childhood research interest somehow influenced and propelled me toward post-secondary studies in interior design and decorating years later, which makes complete sense. The curiosity of mystical knowledge followed me into my early teens; my best friend and I paid frequent visits to the library taking out books on magick, spellcasting, astrology where we would divide the books to study at home, then share our learnings at a later time. It was during this period I purchased my very first Tarot deck as well – the Sharman-Caselli Tarot, a beginners deck closely based on the traditional Rider Waite. I remember feeling nervous; I wasn’t sure about what exactly I was getting into… I can sense this is a powerful tool… but is it like the Ouija board? What will I unleash from Pandora’s Box?! What will my mom say! The latter concern was quite silly actually as my family has always been very open-minded and still frequently see psychics and mediums – so I don’t think the paranoia about my latest purchase was truly justified. Early on, I practiced behind closed doors and recall being overwhelmed by the 78-card system… how would I memorize everything? What does Temperance mean again? Is The Devil a bad omen that I’ll become possessed or something terrible will happen? For about 10 years I practiced very loosely, with guidebook in tow. During that period I would also begin to lose touch with my magickal self as the adventure + drama of teenage life transitioned into focussing on part-time jobs, post-secondary education, finding a career path, becoming an adult etc. It wasn’t until my mid-twenties when my spirituality (likely due to my guides stepping in) sought me out during a rough patch – and I returned the call in the form of seeking peace + higher insight through meditation. I dabbled in crystal healing, worked with a psychic medium and reignited my passion for mystery + metaphysics while dragging my feet along a mundane path of corporate work. For years, my intuition showed me I could trust it through everyday instances of clairvoyance or clairsentience; I knew I was meant to help others in a greater way and itched to get back into Tarot. An unfortunate break from work — or rather, a divine intervention — in 2014 cracked opened the floodgates of opportunity to deep dive straight into self-study, with the promise I would come out not having to rely on the guidebook for interpretation, but rather, offer wisdom from my own personal experience with the cards. So I began studying feverishly and seriously to make the most of my time. I gathered resonant interpretations from various guidebooks as a basis, then compiled my own repertoire of thoughts/experiences for each card in both the Minor + Major Arcana, filling countless journals with my notes since. I pulled cards for myself each morning and documented relevant experiences according to the theme of the card daily. And must say, Tarot is indeed the study of a lifetime. I began reading for family and friends and steadily committed to practicing, learning + pulling cards for myself; refining my skills and abilities over and over. It was only when I created a fundraiser for a local animal welfare organization in 2016 that I decided to offer donation-based email readings to strangers. Through a good friend, I also had the opportunity to raise funds at a yoga studio which brought me face to face with paying clients for the very first time. Of course I was nervous, and prepped by meditating for most of the day prior to the gig – but knew deep down that if I worked from my heartspace, not the mind, everything would run smoothly. And so it did. Pushing myself beyond my comfort zone is what propelled me into the world of offering more than just Tarot readings, but gentle guidance + support to lovely clients on their own journeys. 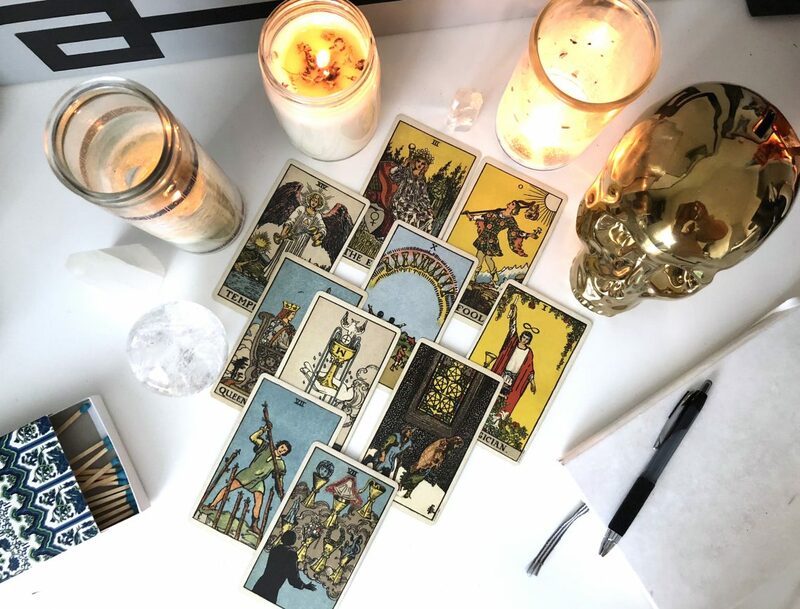 Not only has my Tarot practice grown tremendously since its humble roots in my teenage years but my own brand of spirituality, beliefs + personal development have evolved through time as well. I was born seeing the beauty + potential in all things. In one aspect: I am an artistic, creative soul on a journey which has led me down various avenues in search of the perfect medium to express the magick stirring within my soul. I ventured into fine art photography; graduated with Honours from an interior decorating program; worked at vintage furniture shops and as design editor/stylist for a Toronto-based interior design magazine; took on my own decor clients; threw paint at canvasses; explored crumbling farmhouses and old cemeteries to capture the perfect decrepit photo; designed wedding invitations for friends; handmade one of a kind, intentional pieces with natural objects found on nature walks + hikes. I live for dynamic artistic experiences, soul-expression and the continual inspiration that surrounds me, even if slumped in the doldrums of the day-to-day (where I recently found myself working 6 years too long). Despite the environment, my magickal mindset is always at work. On the other hand: I’ve always possessed an inherent knowing — an undercurrent running through my veins making me acutely aware of my purpose to affect change + do greater work beyond the surface level. The gift of clear-feeling or clairsentience allows me to see/feel both the beauty + pains of the world, which strengthens my compassion, empathy, non-judgement + inclusion of all and especially those in need. I understand the light + dark aspects of life the Ying Yang, and strive to balance both through large or small acts of kindness. Whether being able to sense who the new kid was and take conscious action to make them feel safe + included, to sending Reiki to injured animals, donating to social justice charities, picking up garbage in the neighbourhood ravine, carrying grocery bags up the subway stairs for an elderly man, acknowledging strangers on the sidewalk with a smile — I just try to do my small part to make the world a more pleasant place everyday. An inner-knowing tells me we are one, and I am here to support, give a voice to and assist others where possible to rebalance the collective scales. Through continuous learning and un-learning, I transform: my perspectives, compassion, humility and need to be of service grow. At this time, life has converged my creative + spiritual aspects into a single flow, so my personal self-expression taps into both streams simultaneously. All acts of creation are spiritual if it comes from the soul — the desire to use energy intentionally to cultivate a harmonious experience, can be done in more ways than one. We have the ability to consciously weave the life we want for ourselves + others. 2018 has been a year of profound transformation, and have diligently worked on reconnecting with my core essence, my curious inner child + reclaiming the wild feminine within, suppressed for thousands of years and also throughout parts of my own incarnation. I am finding my voice once again, redefining boundaries + tapping into fierce healer/wise woman energy which patriarchal society has tried to tame for a good chunk of my life, despite having the self-confidence to be different in my own way. No more playing small — I am here to fulfill my potential. Slowly, I reawakened to my inner magick and power, expanding my consciousness spiritually and of the tangible world. Over the past 6 years I received certification in Reiki I and II, astrology fundamentals, I became a Yin yoga teacher and sound healing practitioner. I continue taking courses in the psychic arts + learning alternative healing modalities helping myself and others in meaningful ways to enrich our lives far beyond the material realm. Not to mention, re-establishing a connection to the rhythms of mother nature and moon cycles have attuned my spirit that much more to the vast fabric of universal energy we are all threaded into. I offer myself to be of service to our earth mother, for her sustenance is what makes existence possible. So with child-like wonderment I tap into the mysteries of life again from a matured perspective this time around — with purpose. I carry the realization that there is always more to learn but much more to figure out and master within us, than without. My winding path is eclectic, one which blends creativity + spirituality aiming to seek inner truth, healing, joy. And welcomes the kinship of others also willing to seek answers within. The mystical, magickal Tarot is depicted by Major and Minor Arcana cards – reflecting both the groundbreaking events and the mundane that make up the journey of our lives, which bring forth constant lessons + inspiration – sometimes through irony, tough love, or better yet, amazing synchronicities! Regardless of the vehicle, life throws us exactly what is needed to assist our evolution: to further expand our intellectual, emotional and spiritual facets. The culmination of our experience is strategically dispersed and woven into our reality as a basis for personal growth, so when space for self-reflection is honoured, we can consciously recognize where tweaks and enhancements are necessary for realignment on our true path. Because we are incredibly unique, diverse + individualistic, so are the journeys we undertake, making life a fascinating teacher: wisdom + personal lessons can be acquired in every second of the day, in every person or situation we encounter. By discerning how to appropriately apply our wisdom + lessons over time, is how we carve out our personal paths + transcend the “issues” of 3D reality. All it takes is a little change in perspective and introspection. By tapping into subconscious realms via intuition, meditation, and in conjunction with divinatory tools such as Tarot, we are better able to see ourselves in true, unadulterated light. Like peering into a still, clear stream and making contact with your own reflection can be jarring at first, but given the opportunity to view oneself through a new lens, may actually be rather illuminating. This is what Tarot offers: an honest, un-bias perspective that shines light onto areas of life we may not be vividly conscious or aware of. It provides a neutral perspective for the chance to re-evaluate things fairly. An alternative perspective may actually be the key to our freedom. Additionally, by glimpsing into our true selves, our inner emotions/old thought patterns can be revealed and brought up to the surface so powerful healing + transformation can occur. By working to remove mental/emotional blocks, we may navigate our own mysteriously wonderful paths more seamlessly. Although not always easy, it is incredibly rewarding work for those on an inward journey of self-development. I’m deeply honoured you are here. It means we share the same drive for growth, truth + self-empowerment to make conscious, deliberate changes + evolve into greater versions of ourselves. Taking the initiative to heal wounds or remove layers of illusion transforms our reality into high vibrational, happier places to be, where we are better able to notice + harness the magick around us. As an eternal student, metaphysical explorer + creative soul (and when not delving into the cards) I find my happiness + inspiration while getting lost in nature, skygazing into burning sunsets or sparkling stars, painting abstract expressionism, DIY-ing anything, reading uplifting texts + playing with my kitties above all! I hope you enjoyed getting to know me a little more + I look forward to our paths serendipitously entwining.